My second carving of the recently-excavated Bronze Age Must Farm wooden box, found along with other remarkable archaeological remains in a collapsed roundhouse in the Fens, has left me with more questions. That’s what fact-finding is for. As you can see from the photos, it’s a lovely little box, small and delicate. Vicky Herring’s fabulous drawings show more details, including the suggestion of an interior seat for a lid. But no lid was found with the surviving parts of the box. Maybe it had a lid but at the time of the round house fire and collapse this had been taken off and left somewhere else. Maybe the lid fell away in the collapse and will be found in lower deposits. Maybe it burnt up in the fire. So should I carve a lid? The only evidence is negative evidence – the seat inside the box, which itself is partial. Not much to go on. Well, what use is a box without a lid? Especially a small box like this that ought to have little treasures tucked away in it. The wood is so green – the tree was cut down just a few weeks ago – that the sap was coming out of fibres as I cut them. The lid is very thin, especially as I cut out a recessed panel like those in the long sides and base of the excavated box. The surface area is therefore large in comparison to the volume of wood; this means that the very green wood can dry out really fast. And even faster, because I brought the box and lid into my warm house. So already the lid has shrunk. It’s not such a good fit as when I first made it just 24 hours ago. There are two choices. Make the box from green wood or from seasoned wood. Each has advantages and disadvantages. I can’t wait to find out more about the wood that the Bronze Age box is made of. Hopefully the post-excavation analysis will reveal the species of tree. This afternoon I completed my second fact-finding version of the fabulous Must Farm Bronze Age box. The first attempt involved making an approximation of the box excavated at Must Farm to show me some of the general problems I would be likely to encounter. The second was more about all the little devils in the detail. The first task was to study the fabulous artefact drawings and note the box’s measurements. The box was found in pieces and one end is very poorly preserved. This means that whilst the width and depth measurements are fairly reliable, the length is not. The finer details, like wall thickness, are variable. That’s probably for more than one reason, including the different parts that have survived and the way the waterlogged wood has changed shape over time, as well as the original dimensions as carved. Version 2 is closer to the original, in terms of shape and size, than version 1, and I have included an internal lip as suggested by the drawings. This might have been the seat for a lid, although no lid was found with the box. Like the first, this second version is willow. The willow again was problematic: whilst its fresh, green, state made it really easy to cut, the open fibrous nature of this wood makes it difficult to get a good clean finish in the small, confined spaces of the box. To make progress I’ve got to the stage where I need to know the original wood species – and will have to wait for the post-excavation analysis. In dealing with some of the torn and hairy wood fibres I have over-cut in various places, so that the dimensions aren’t quite perfect. In trying to make the interior of the long side walls close to vertical, I have over-cut the depth of the interior by a couple millimetres. This has left the base rather thin, whilst the two short end walls are too thick at the base and slightly over-cut at the top. On the flip side, I have to make assumptions about the dimensions to cope with the missing parts. The lid seat is a good example of this. There isn’t much information in the drawings about it, I have made decisions about the shape and size, so the spots that I am unhappy about are only where I have failed to meet my own instructions – not necessarily what the box really looked like. I have cut the lid seat around the whole of my box. A lid for my version 2 would therefore have to press down onto the top of the box, engaging with all four sides. One short end of the Bronze Age box, however, is (mostly) missing, so I can’t actually tell if this is how it looked originally. It might have been open at the missing end, so that a lid could slide onto the seat – like a wooden pencil or domino box. That interpretation is less likely, because there the original doesn’t seem to have channels cut in the long sides for a lid to slide along. Hence my interpretation of a seat to house a lid engaging vertically with the box. Have you seen the amazing archaeology being excavated at Must Farm by the Cambridge Archaeological Unit? Must Farm is one of the most important Bronze Age sites in Europe, because of the spectacular preservation. The remains that survive are wonderfully intact, including things that we’ve never seen before. This includes, for example, the roofing timbers of the settlement’s roundhouses; whole pottery bowls with their contents; a fleet of log boats; animal tracks and footprints in the mud around the settlement. Check out the photos from the past few months’ of digging – there’s even the most complete Bronze Age wheel! We don’t yet know what species the box is carved from, but it’s a hollow form; meaning it was carved from one piece of wood, not made from panels jointed together. 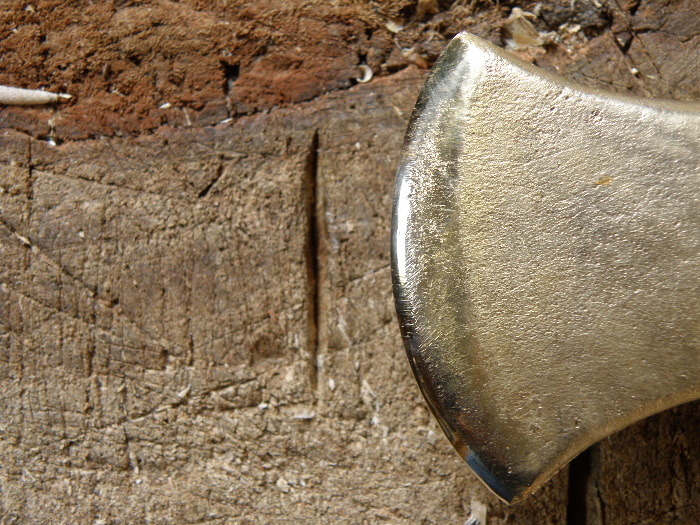 My rough-out is approximately the right size and is carved from a billet cut from the same portion of branch as the Bronze Age box. Its base and two long sides have recessed panels like the original, although their depth and shape need adjustment. Inside, I have carved roughly the right shape but didn’t cut a groove to seat a lid. The original seems to have a groove for a lid to fit into, but no lid was found with the box and I’d like some more information before working on this. The internal dimensions are challenging to carve. The box is about 37mm wide inside and 29mm deep, making for a very narrow, shallow space to get tools and fingers into. Working with very green wood is a great help, but the thin sides and base are at greater risk of splitting as the wood dries out. And the dimensions will change as the wood dries, that’s something to compensate for. The drawing suggests that the corners in the bottom of the box are rounded, concave, curves. I achieved this using my spoon-knives. It’s not clear to me whether this shape was original or the result of use, or of change over time in the waterlogged mud. If original, then this suggests that the Bronze Age carver did not use a straight edge to cut right-angled corners into the box. 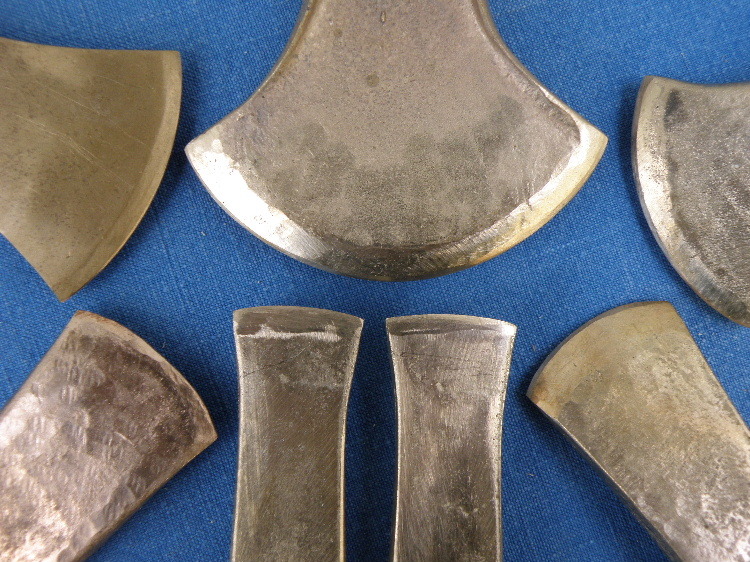 That’s an issue because there are many cutting tools from the Bronze Age with straight or flat edges, but very few that cut in the way that spoon-knives cut. And although there are various types of gouge, the internal space of this box is tiny – hardly any space in which to turn the cutting edge of a tool to make these complex curves and so that the wood fibres are cut, not torn. A closer examination of the original might throw some light on this. 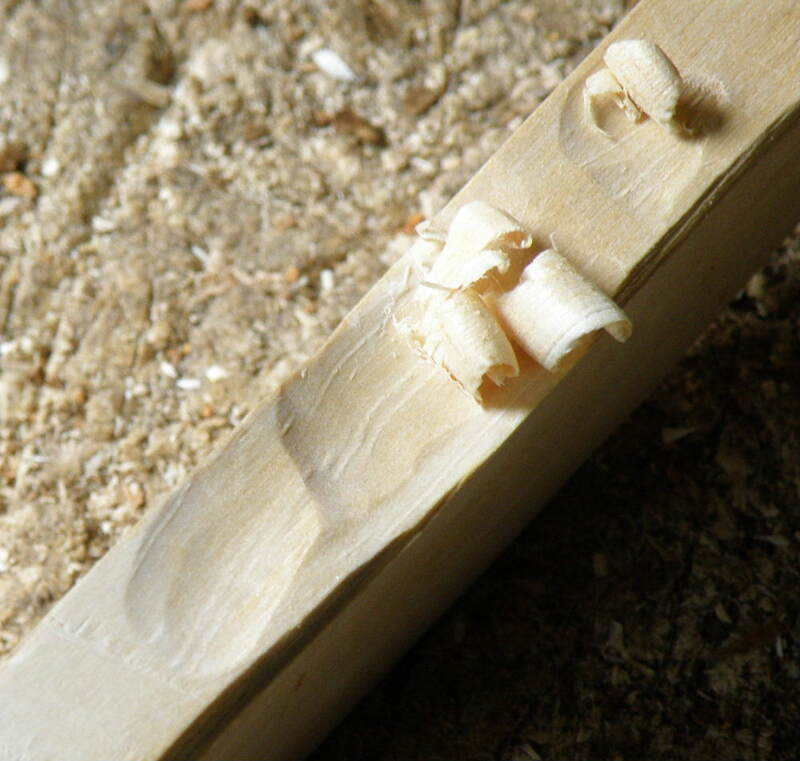 The type of wood will make a difference to its cut-ability too. The willow I bodged has an open, fibrous, texture making it tricky to get a good finish in that tiny inside. Also, the fibres tend to pull out giving the outside a slightly hairy look where I haven’t finished it tidily. The widest growth ring shown in the box drawing is about 5mm, and in the c47mm radius in the end-grain of the box there are 15 rings. It looks like a diffuse-porous tree species (one in which the Spring-grown and Summer-grown vessels are of an even size across the growth ring). It will be interesting to see just from where in the tree the specialist analysing the box thinks the wood was taken. Thanks to the phenomenal Graham Taylor for great day spent at the Stonehenge Visitor Centre with some lovely people earlier this month! I had a great time discussing prehistoric pottery, practicing pinching out round-bottomed bowls, trying to make Beaker shapes, and thinking about clay sources on and around Wiltshire’s chalk uplands. Up here further north in the county, where there is more variety of clay, I can’t wait to go gathering. It’s huge fun taking a bucket of clay, processing it, testing its qualities and working out what it’s good for. I did this for three clays from Exeter and one from Charmouth a few years ago. They were all different and really good clays, but the most awesome was the one from the coast at Charmouth. It was dark green-grey, because it was full of organic material. Here’s a photo showing an un-fired test tile, a piece from a tile fired to 900C, and the remains of a tile fired to 1280C. At that higher temperature the Charmouth clay melted all over the stoneware waster that supported the test tile in the kiln! What a fabulous, green, glassy slip. The clay was full of lime as well as organics, shown when I tested an un-fired tablet that bubbled up in an acid test in the lab’s fume cabinet. 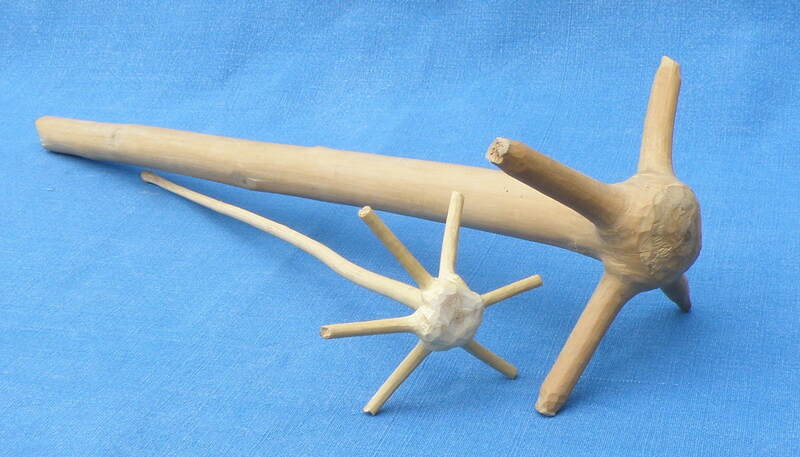 So I’ve been making some tools that should help me to make and decorate prehistoric pots. I’ll need to collect a few more bits and pieces together, but here’s the first batch. EDIT: I fired the little carinated bowl that I potted with Graham but regret to report that it didn’t do too well. It’s cracked, because of temperature fluctuations during the firing that stimulated stresses and strains in the clay body (causing the cracks to grow). And it’s underfired, because the temperature wasn’t hot enough for long enough. The talented Dr H from prehistories kindly joined the North Wiltshire Branch of the Young Archaeologists’ Club in October. Led by Dr H, the morning’s drawing activities focused on some objects from the group’s handling collection. 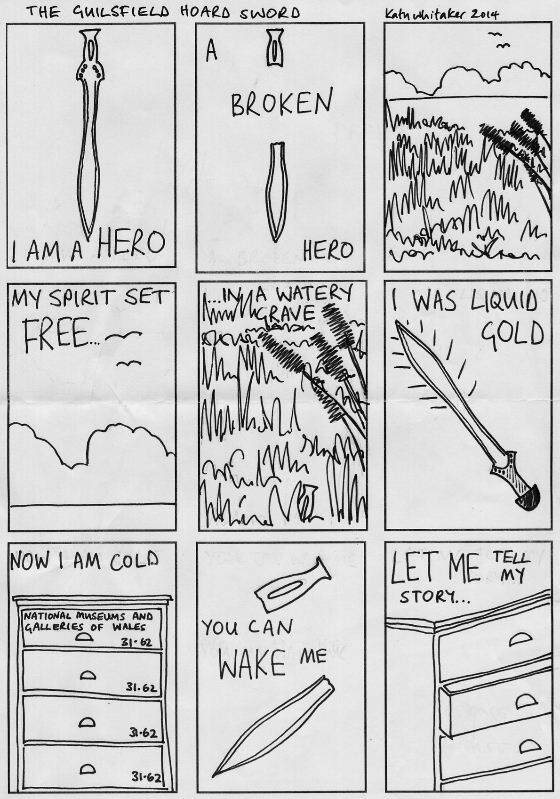 The children did a great job and really enjoyed working on comic books and strips to tell stories inspired by the artefacts. I’ve inked up my effort on the sword from the Guilsfield Hoard. First things first – this post will not tell you how to sharpen your tools. The best advice I can give you – without showing you – about how to sharpen your (steel) tools is (a) read Sainsbury, J. (1984) Sharpening and Care of Woodworking Tools and Equipment Burgess Hill: Guild of Master Craftsmen Publications Ltd. The chapter on hand-tools is very useful, and the book has some great advice on grinding and sharpening equipment suitable for different types of workshop. Then (b) take care over the quality of the materials that your tools are made of; poor quality materials won’t take and keep much of an edge. And finally (c) learn through practice what it feels like to work with your edged tools, how they behave in different materials so you know what’s going on at the edge, and check your edges all the time. So, back to how to keep them sharp. I invest time in sharpening my edged tools. The majority are steel (the rest bronze and flint), with a relatively high carbon content that among other things helps me to sharpen them by hand. Most of my steel tools jumble around in a tool-bag, or when in use can be found lying around on my various chopping blocks or on the end of the shave-horse – recipe for disaster should anything fall to the floor! Which is the main reason why I keep a thick layer of all the wood-shavings and chippings in the workshop. But what about their storage and transport? 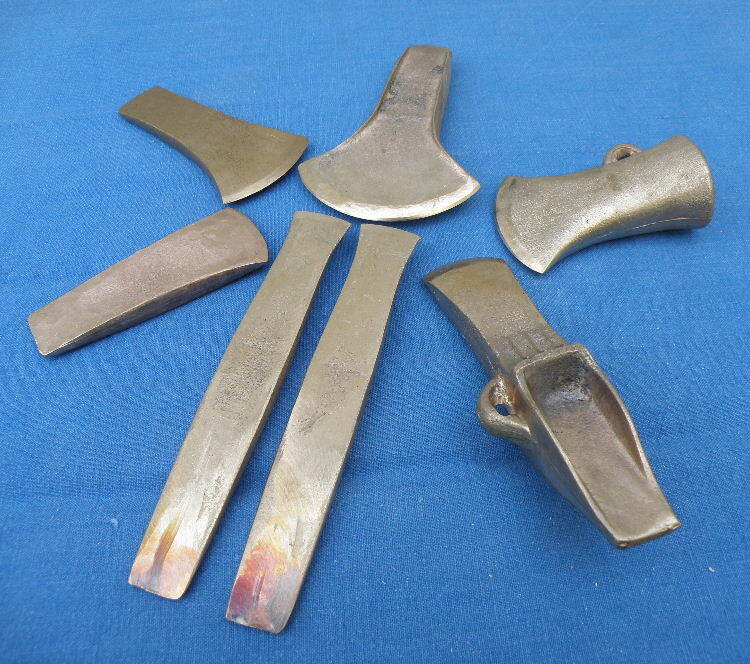 Most of the steel tools are odd shapes and sizes and whilst some came with sheaths, others have no protection. Here is a selection of photos to demonstrate my solutions for keeping my tools sharp. It’s easy to spot the home-made sheaths. Left-handed and right-handed spoon knives. Firmer chisel and fishtail gouge. 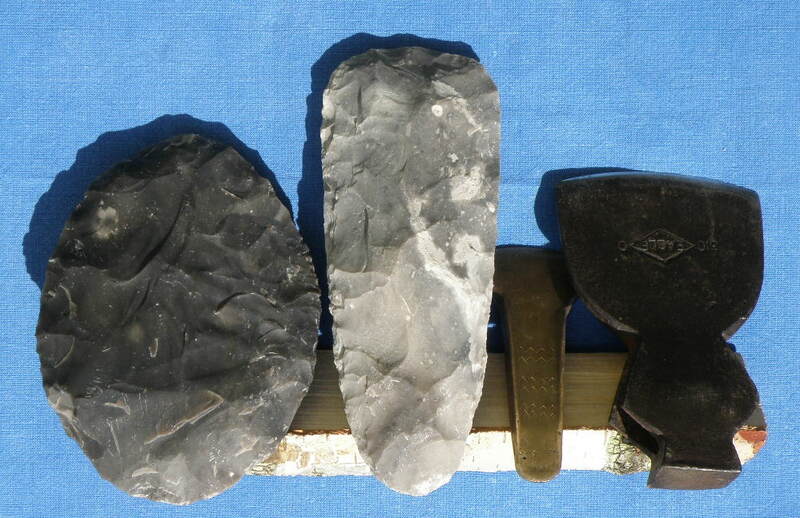 Two axes and an adze. 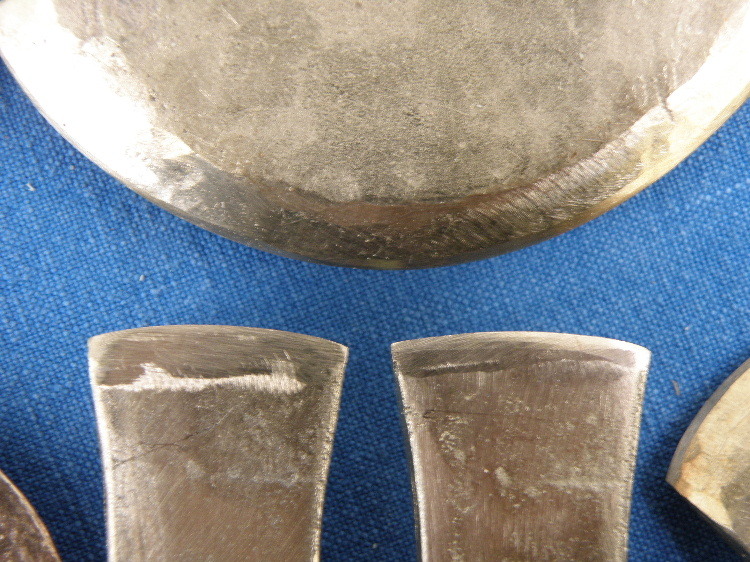 Nevertheless, imperfections in the cutting edges of tools can be revealing. Maybe you’ve watched the TV CSI lab technicians match the tool marks in someone’s skull to potential murder weapons? Remember how they work out which particular type of tyre iron, knife or blunt instrument was used to kill someone by comparing the shapes left in the victim’s bone with marks the CSIs thwack or stab into a suitable test material? 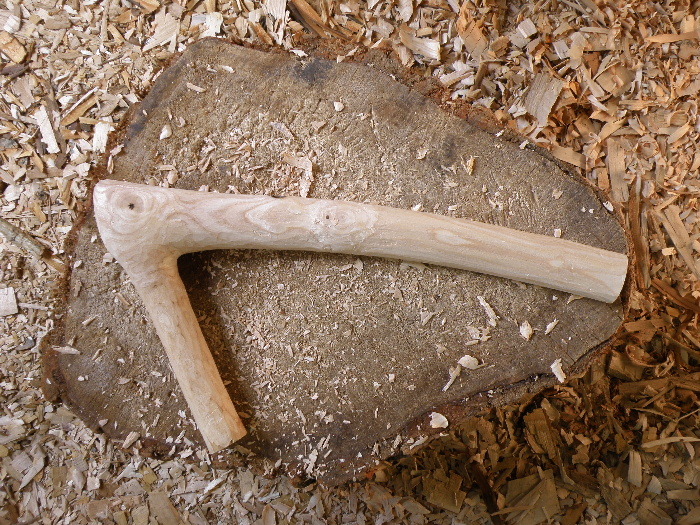 will leave a characteristic mark in the wood that it is used on. Take my right-handed spoon knife. In the photo below, you should be able to see the facets where I have used it to cut little chips away from a piece of birch; and inside the facets, thin, parallel lines which are left by the (currently damaged) knife edge. 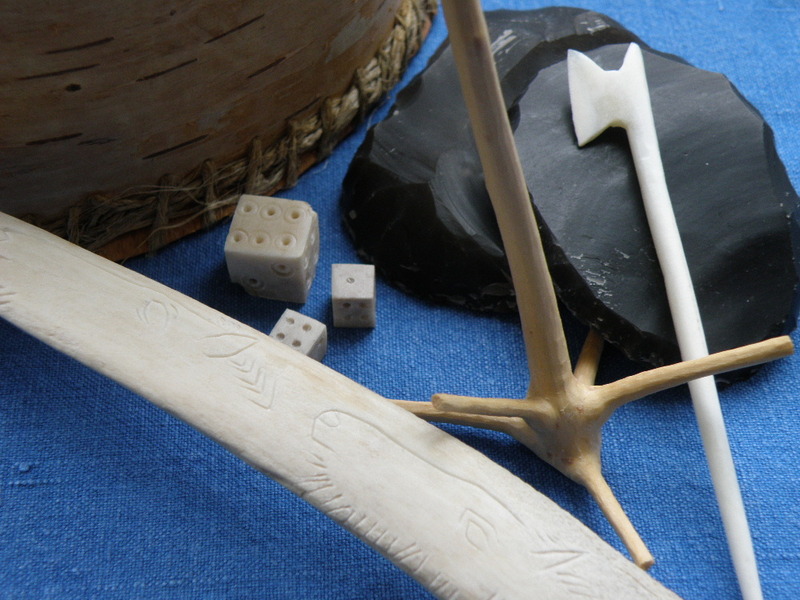 Wouldn’t it be amazing to match up marks on prehistoric wood with the tools that were used to do the carving? For example, some 9000 pieces of wood were recorded from the Area 6A excavations of the Bronze Age timber platform and trackway at Flag Fen (Peterborough, UK) (Taylor 2001:171). Linking tools with timber at Flag Fen could throw light on ways that a major building enterprise was carried out and organised more than 3000 years ago. In theory, the very chisel used to cut a mortise joint could be identified, and we could say “this tool was used to do that job”; just like the antler picks excavated from Stonehenge which were used to dig out the ditch and the holes for the standing stones. In practice, it’s not so simple. First, you need tools in order to study their edges. Despite all that wood, the Flag Fen excavations revealed no more than one socketed gouge and one socketed axe-head (Coombs 2001:263, 265). Why after all would anyone leave their tools behind? Perhaps as part of a ritual, or accidental loss; but not if they are still needed for other activities. 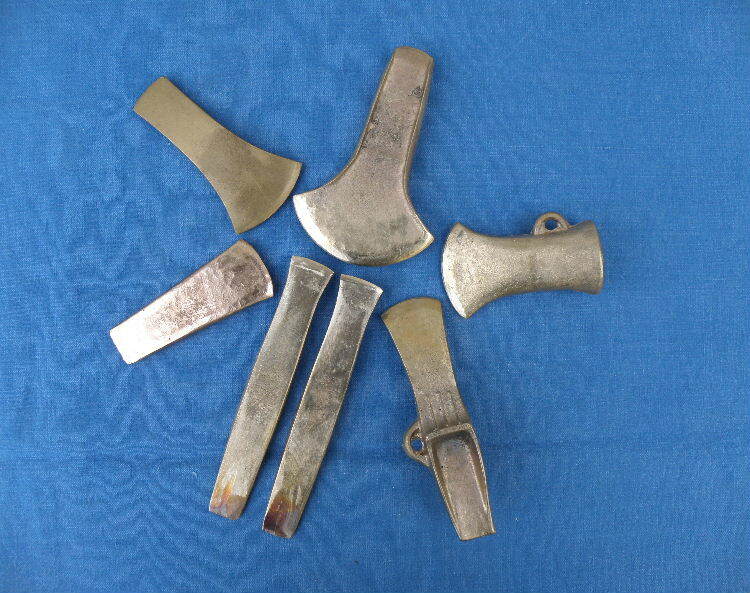 In fact, many of what could be described as Bronze Age carpentry tools – especially axes – have been found in circumstances other than archaeological excavation; they were ploughed up by farmers or found by metal-detectorists, for example, with no associated timber to try to match to. In any event, that timber will only be preserved if the underground conditions are right, like in the waterlogged peat at Flag Fen. 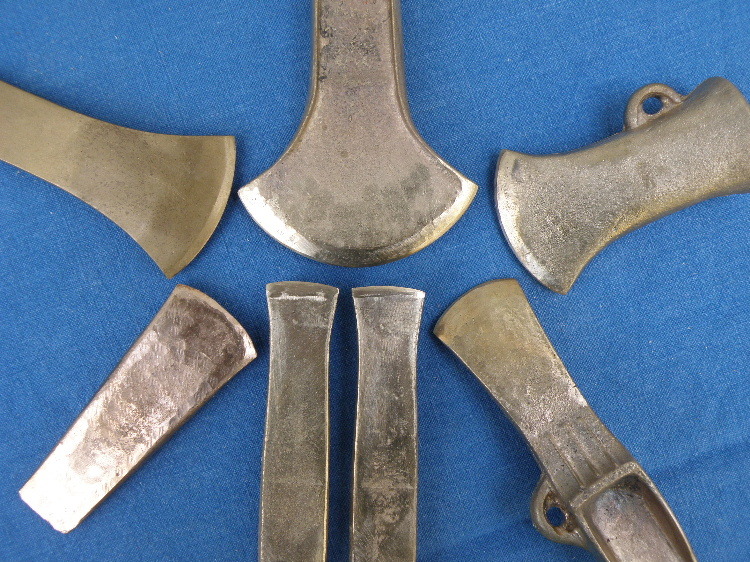 And archaeologically excavated examples of Bronze Age metalwork finds often show, by the careful positioning and arrangement of the objects, that the tools had been put in the ground in carefully deliberated ways (Barber 2003); in what archaeologists call hoards, and not necessarily associated with the timbers that tools might have been used on, nor abandoned in the workplace. 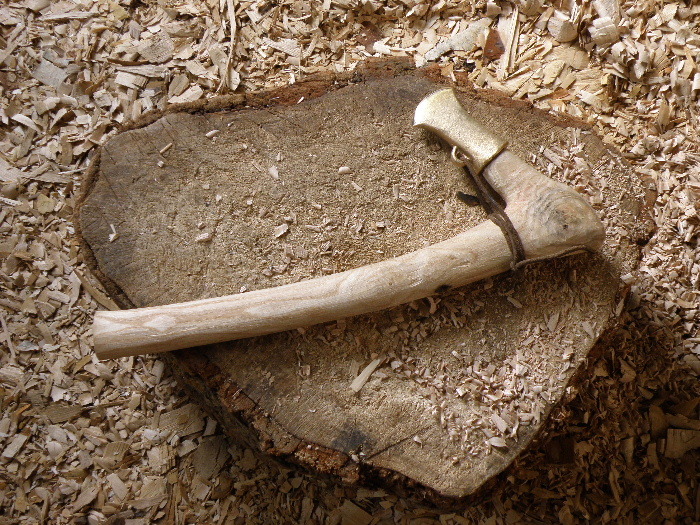 This raises an interesting question: were all Bronze Age carpentry tools intended for woodworking? 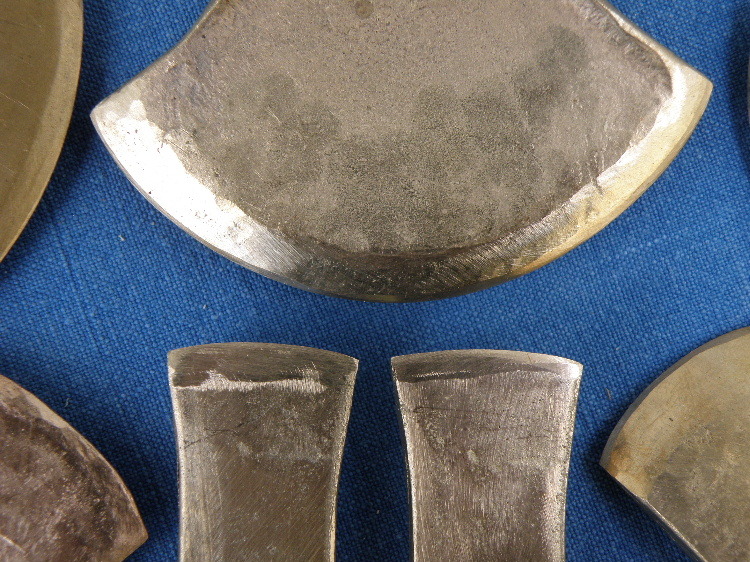 Metal – copper alloys and iron anyway, if not the precious metals – is often seen as “inherently utilitarian” (Barber 2001:164). Yet sometimes there is evidence that tools had not been used. 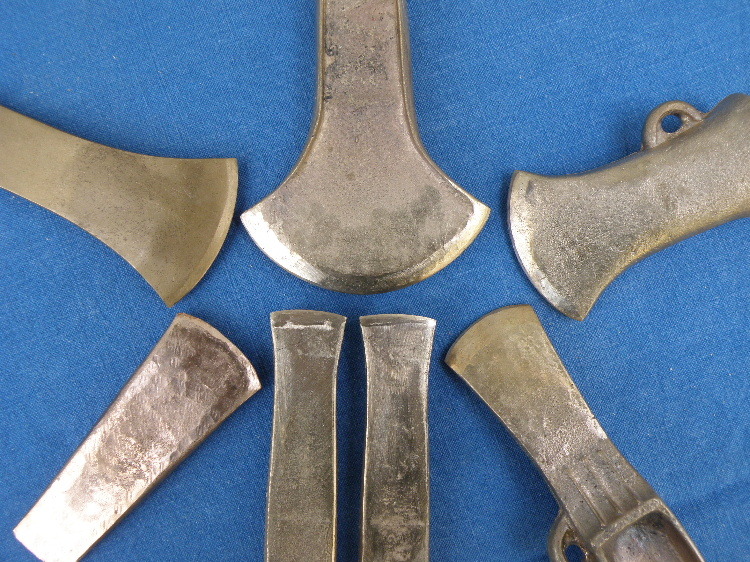 For example, some of the axes from the Manton Copse 2 hoard found in Wiltshire in 1999 (and now in Wiltshire Museum) still bear their casting scars. Were they “poorly finished” as described in the excavation report (Lawson et al 2011:35), or unfinished because they were never intended to be fettled and sharpened for carpentry? Secondly, you need to be able to identify edge damage. This could be difficult if the metal is corroded following thousands of years buried under the ground. Or the object could have been damaged after it was buried, for example if hit by a plough share. Some imperfections, which could leave very characteristic marks, are nevertheless very difficult to see on the edge itself – like on my spoon knife, whose faults cannot be seen with the naked eye but are very obvious in the wood. Thirdly, edge damage is easy to remove, and it is usually in the interest of the carpenter to re-sharpen and re-shape the edge. 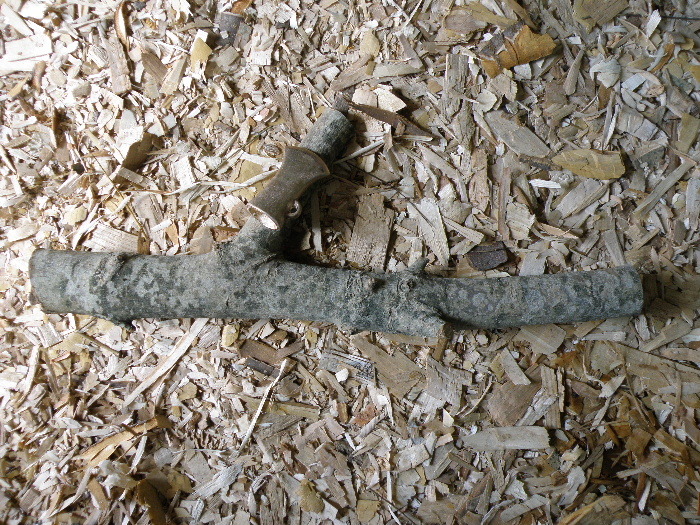 Marks left in the wood might never be traceable to a tool which has been re-worked in this way. There used to be a wonderful example of the reductive effects of sharpening on display in the Museum of St Albans, when the Salaman Collection was exhibited. In the cabinet of sharpening equipment, a new chisel about 25cm long was shown alongside another of same make and original size, but which had been used and sharpened so much it is now only 10cm long. The evidence would also disappear if the tool was recycled – melted down and turned into a new object. That’s not to say that the study of prehistoric toolmarks is wishful thinking. 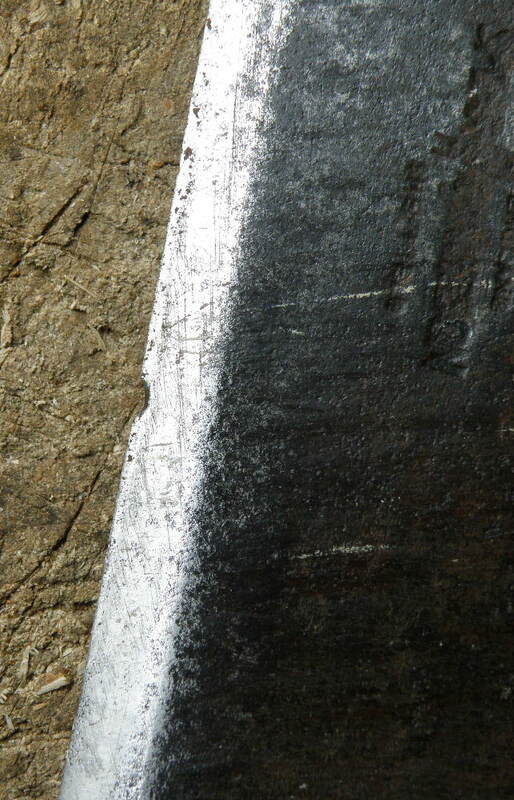 For example, 168 different axes were counted on the basis of the toolmarks left on the Flag Fen timbers. 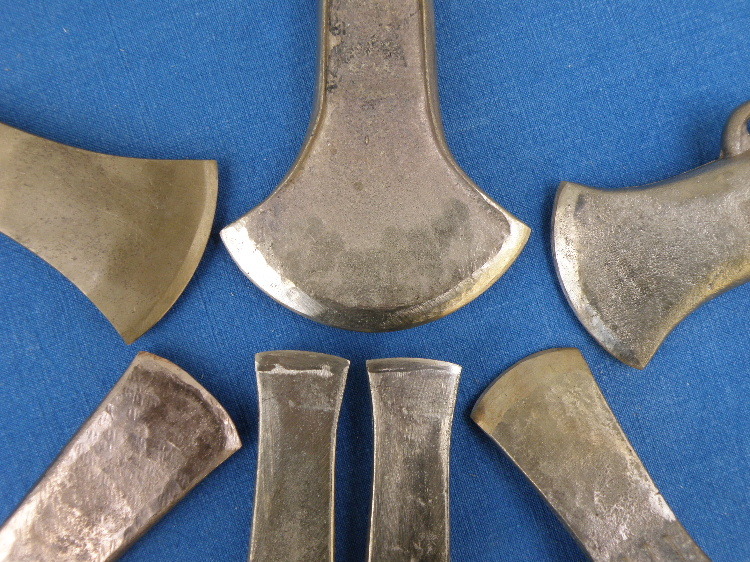 Comparison of the toolmark shapes with the dimensions of different types of British Bronze Age axe led Maisie Taylor to conclude that socketed axes had been used to do the wood-working at the site (Taylor 2001:194-202). More recently, photogrammetric and GIS techniques have been applied to the analysis of toolmarks on hewn prehistoric timber (Kovacs and Hanke 2012, 2013). 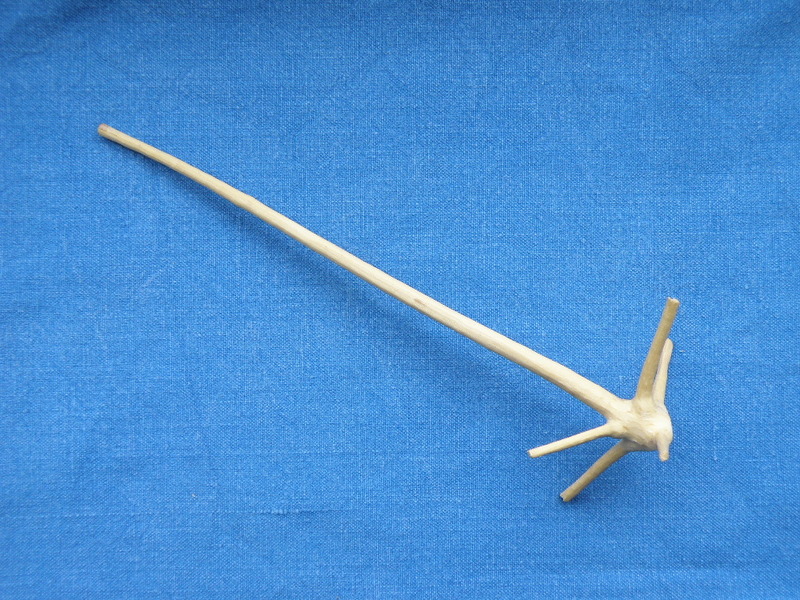 And finally…what might we conclude from the description of the Flag Fen scoop, carved from a piece of willow; “The bowl of the scoop was shaped across the grain and so well finished that no clues survive as to the method of fabrication.” (Taylor 2001:226)?